“We’re the real Sinn Féin, and we are not going away”. 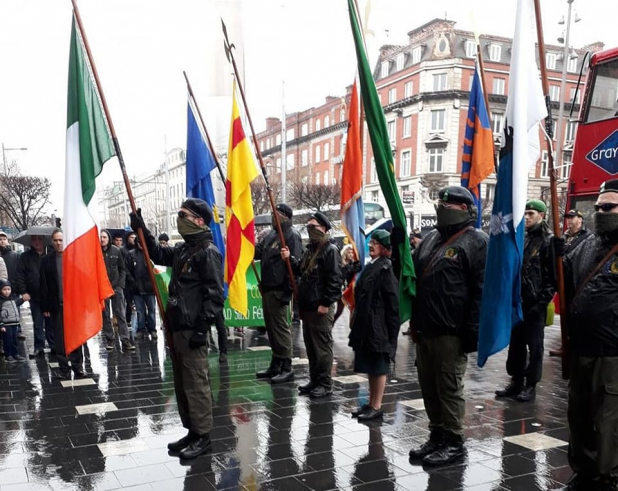 Dissident Republican Group holds paramilitary commemoration at the GPO on Easter Monday. Marching behind the pugnacious melody of a bagpiper, a small group of men and women in a paramilitary-style colour party made their way down from the Garden of Remembrance towards the GPO alongside supporters and onlookers numbering about 100. This was the Republican Sinn Féin 1916 Easter Commemoration. As they braved the heavy rain crashing down upon the city, they painted a picture of a small yet determined band of revolutionaries seemingly unphased by the reality of their situation. Addressing the huddled crowd under the shroud of the GPO, an older man seemingly the chair of event, spoke passionately to the crowd. He welcomed those who had come, and complimented their dedication. He then spoke about how “Provisional Sinn Féin” had abandoned the ideals of the men and women of 1916, that they now actively aided British rule in Ireland, and so long as Republican Sinn Féin exist they will continue to highlight this betrayal. He said that “we are the real Sinn Féin, and that we aren’t going away” After about 5 minutes of successfully winning the small crowd over, he called upon another man to read the 1916 Proclamation which was also received with large cheers from the small crowd. The last person to address the crowd was Republican Sinn Féin president Des Dalton. He spoke on a number of subjects, from the continuing theme of RSF being the true inheritors of 1916, to railing against the ever increasing power of the European Union. Then he turned his attention to the numerous members of An Garda Siochana’s Special Detective Unit in the crowd who had been taking the names and addresses of those in attendance. Dalton accused the Gardai of being part of an “orchestrated campaign of harassment” against Republicans. He also alluded to the clashes in Lurgan, Co.Armagh between Republicans and the PSNI, and that such “harassment” would not deter Republicans from their cause. (I later asked one of the Gardai in attendance about allegations of harassment, but he said he could not comment). Finally echoing the words of Patrick Pearse, Dalton said “so long as there is a British presence in Ireland, there will always be Irish people willing to fight against that”. The event ended with the lowering of the flags, and the National Anthem being sung. Who are Republican Sinn Féin? Republican Sinn Féin are a small political organisation, present on both sides of the border, that split from Sinn Féin in 1986 when former Sinn Féin president Ruairi O’Bradaigh led a walkout of that years Ard Fheis in protest of the strategy of then president Gerry Adams to recognise as legitimate the government of the 26 county Irish Republic. Since then the group have been perennial critics of Sinn Féin, and refuse to recognise the legitimacy of Northern Ireland or the Republic of Ireland. Instead claiming to be the true inheritors of the 32 county Irish Republic established in 1916, and ratified in 1919 by the first Dail. Critics say Republican Sinn Féin are clinging to a highly abstract ideal that the majority of Irish people now reject. That they offer no real solutions and are almost content to be a hardline minority, placing ideological purity above realpolitik. They are also alleged to be linked to the Continuity IRA, an organisation that continues to use terrorism, violence, and intimidation in pursuit of its goals, most notoriously murdering PSNI officer Stephen Carroll in 2009. Whilst Republican Sinn Féin deny this link, they continue to raise money for the families of CIRA members in jail, and in the past some members of Republican Sinn Féin have been alleged to also be members of the Continuity IRA. Republican Sinn Féin and the schizophrenic nature of support for Irish Republicanism in Ireland. Whilst at the commemoration yesterday, I spoke to a woman who had a look of disgust across her face. I asked her “What do you think of the commemoration?” She replied that “These people are thugs, they have nothing to do with Pearse or Connolly”. And while I think that is the popular view in Ireland, it is a deeply flawed position when subjected to scrutiny. Today Republican Sinn Féin have very little support. In 1916 Pearse and Connolly had very little also. The overwhelming majority of people supported “Home Rule” as opposed to the Republic envisioned by Pearse and Connolly. Not only that, the Irish Volunteers in 1914 had split with most backing “Home Rule” also. Of the small numbers Volunteers left committed to the “Republic”, the Pearse lead faction was an even smaller minority because they wanted to take up arms. And without any democratic mandate whatsoever they provoked a conflict they knew they couldn’t win and in doing so turned much of Dublin City into rubble. Not to mention their willingness to murder unarmed civilians including women and children.